I actually could not find a book that really fits this description. Usually if my opinion of a book changes, it is because I learned to appreciate what I could not originally. If I loved a book when I first read it, it was probably for reasons that still apply. So the closest I can get is a book which has dipped slightly in my estimation. I still like it, I still admire it, it is still a good, well-written story that inspires me and that I would recommend to others. But its flaws were more apparent on my reread than on the first time. 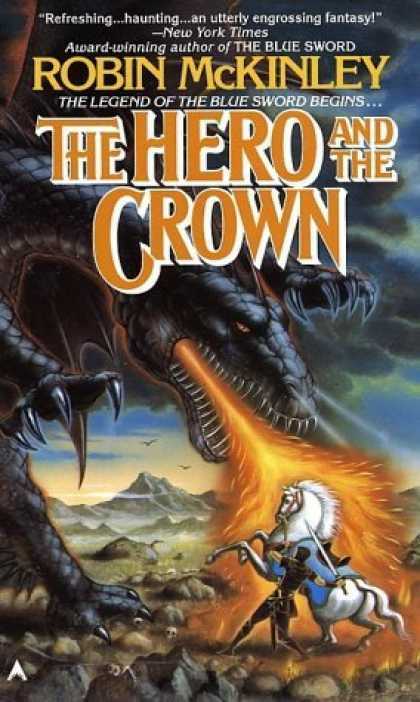 The book is The Hero and the Crown by Robin McKinley. Maur really is an awesome dragon. That is someone McKinley did right. The story is a fascinating take on the traditional “kill the evil dragon” quest. The kingdom of Damar is threatened with civil war, invasion from magical Northerners, and Maur, the last of the great dragons. King Arlbeth leads his army to deal with the invaders, but has not the resource to send after the dragon, so his daughter, the red-haired oddball Princess Aerin, sets off on her own, with a special concoction that protects against dragonfire. There are all sorts of neat elements to the story: the extended period where Aerin experiments and discovers the fireproof concoction, her hunting of the small “dumb” dragons in the forest, the noble character of her old steed Talat, the battle with Maur coming sooner than expected and proving only the first step towards the solution, the time-bending nature of the great tower she must climb, and the army of great wild dogs and cats that gathers around her in the Northern wilds. All great stuff. The part I don’t like, which partly went over my head when I read it first in grade school, is Aerin’s romantic relationship with Luthe. They do not feel well-matched to me, and on a reread I noticed that part of that is because there is a huge age difference between them. But worse is that the book implies a sexual relationship between them, and condones it, even though Aerin is engaged to Tor and returns his love. She knows that upon returning to the castle she will soon marry Tor, and she is fine with that because she loves him and he is one of her best friends, but still she thinks it is okay to carry on a romantic and sexual relationship with Luthe. Somehow we are supposed to think this is okay because Tor never finds out and presumably just isn’t on the same level as the magical time-bending not-quite-mortal Luthe. But it isn’t. It’s cheating. It’s wrong. If Tor had found out, he would have been heartbroken. Aerin thinks it’s all just dandy, McKinley seems to agree, and that’s a problem. So is the book still good? Definitely. Is it as good as I had first thought it was? Not quite.